'Keep your lips looking sharp with my precision pencils.' 'Napoleon. Our Lip Liner is a true treat for the lips, the ideal partner to either a full coverage lipstick or a shiny gloss. 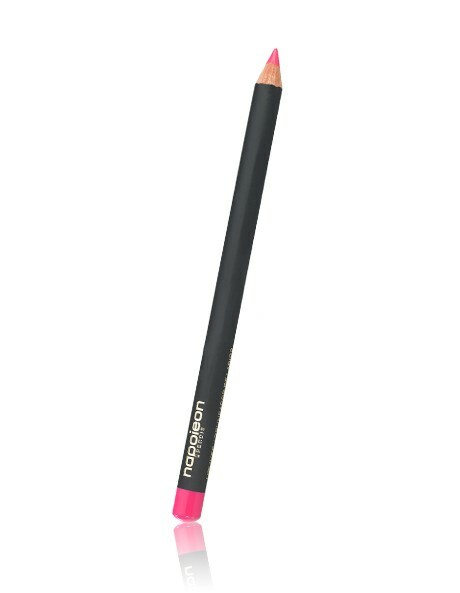 Each pencil provides a soft and smooth look. To enhance the natural shape of your lips, the liner glides on gently with no feathering. The lasting formula is free of mineral oil and preservatives and contains natural anti-oxidants for added protection. INGREDIENTS: HYDROGENATED PALM KERNEL GLYCERIDES, HYDROGENATED VEGETABLE OIL, CAPRYLIC/CAPRIC TRYGLYCERIDE, HYDROGENATED PALM GLYCERIDES, TALC, RHUS SUCCEDANEA FRUIT WAX, TOCOPHEROL, ASCORBYL PALMITATE. MAY CONTAIN: IRON OXIDES (CI 77491, CI77492, CI 77499), RED 7 LAKE, TITANIUM DIOXIDE (CI77891), RED 28 LAKE, MICA (CI 77019), BISMUTH OXYCHLORIDE (CI 77163), BLUE 1 LAKE, CARMINE (CI 75470), MANGANESE VIOLET (CI 77742), RED 21, RED 22 LAKE, RED 30, RED 6 (CI 15850), RED 7, YELLOW 5 LAKE, YELLOW 6 LAKE, ZINC OXIDE (CI 77947).